← Let’s talk about Love. Photo taken using my LG Optimus black, a street dance performance by people from Tuboran, Naawan. First “racism” I’ve ever encountered during my freshman year. I was appalled by the naive personality of the person sitting right in front of me. I didn’t hate her that much; instead, I pitied her lack of knowledge of her own country. I’ve always assumed that this “Manila-centric” ideals have transformed into modern myths – I didn’t expect that some proud UPCAT passer could be that judgmental. Perhaps a one and a half hour ride in a sleek-to-bumpy-and-dusty road from CDO will take you to my hometown. I couldn’t remember any adjective attached to it before — but now, they (you can say, we) claim to be called the Municipality of Friendly Naawan. Cute. I could set up an entire new blog if I wish to spill all my childhood stories in this humble abode; however, my intentions in writing this post was purely to greet the “Naawanons” a wonderful and much blessed fiesta! 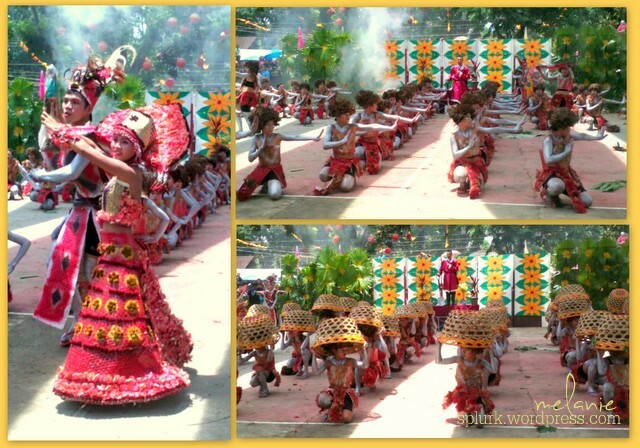 Looking at the children while they dance to the beat of the drums, I became enthralled of how each of them would grow up! I mean, I could’t remember participating on a street dance in our plaza – but I do have photos of myself waltzing there! Oh yes, I knew how to dance when I was younger. I think everyone is always better when they were younger. Although I couldn’t say hi to every familiar face that I saw today, I wish they knew that I am proud of them… Friends who climbed mango trees with me back then, classmates who bought me ice candies during grade school, and my parents’ colleagues who often pinch my face and exclaim how I never grow tall! ** What? You’re from Mindanao? You have such white complexion to be one!